This past weekend we had our Still Water Winter Practice Retreat at the Am Kolel Sanctuary near Beallsville, Maryland. During the weekend we explored together in our sittings and Dharma sharings the Four Foundations of Mindfulness, the Buddha’s framework for how to cultivate mindfulness: by observing with full awareness our bodies, embodied feelings, mind, and objects of mind. For me, studying and practicing the Four Foundations is always interesting and worthwhile. It can be said that the practice of Plum Village is the practice of arriving. Because we have been practicing running all the time, and we have not arrived. Coming to Plum Village you have to arrive. Otherwise we will run for all our life and our children will continue to run for all their lives, and several generations will continue to run and never find their true home. How to practice in order to arrive and to feel at home, that is the point. Everything you are looking for is in the present moment, including God, including the Pure Land, including the Buddha. The blue sky, life, especially life, can only be touched in the present moment. … So the practice here in Plum Village is to go back to the present moment, every time, and to go back by the techniques of walking and breathing. Always go back to the here and the now, because it is the only place where you can find your home, your address. Your true address is: body, mind, united here and now. You don’t need any zip code. This Thursday evening we will begin our meditation period with a brief guided meditation on arriving home in the here and now. 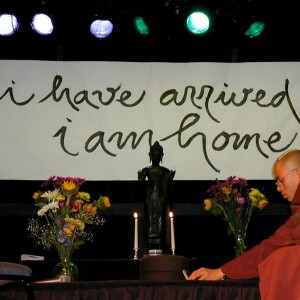 Our Dharma sharing will focus on our experience with arriving home. What are the practices that help us to truly come home? What are the challenges we face on retreat and in our daily life? Your are invited to be with us. This Thursday we will also offer a brief newcomer’s orientation to mindfulness practice and to the Still Water community. The orientation will begin at 6:30 pm, and participants are encouraged to stay for the evening program. If you would like to attend the orientation, it is helpful if you let us know by emailing us at info@StillWaterMPC.org. Below is the meditation poem that begins with “I have arrived” and also several more paragraphs from Thich Nhat Hanh’s Dharma talk. In the here, in the now. I am solid, I am free. a Dharma Talk given by Thich Nhat Hanh on August 6, 1997 in Plum Village, France. Your true home is always there. If you know how to handle the monkey within yourself, how to stop running. Each of us is like a hungry ghost. We are hungry for love, we are hungry for understanding. We are hungry for stability, for freedom, and that is why we have been running all the time. We have not had a chance to stop and rest. That is why the practice of meditation is first of all the practice of stopping and resting in order to go back to your true home. That is the real meaning of samatha. Samatha means stopping, calming. Samatha has the meaning of lulling, it is like a lullaby, to take care of it like a baby; to calm it down; to stop its crying; to make it feel peaceful. Samatha is like that, because there is a child in us always suffering, always agitated. That is the other aspect of the monkey, always agitating, always suffering, always crying, and samatha is the practice to stop, to calm and to embrace. There is a child that suffers in us. There is a monkey who is restless in us. But we need someone to take care of the child, to take care of the monkey, to embrace them. We have to provide that person that will do the work. We cannot let the monkey be alone. We cannot let the hungry ghost in us, the hungry child, the suffering child in us, to be alone. We have to come home and take care and embrace. That is the practice of samatha.